It was 5 degrees Farenheit this morning with at least 5 inches of powdery snow turning the DMV landscape into a Winter Wonderland. With the Federal Government and Schools closed due to the second visit of a Polar Vortex, a new weather-related vocabulary for our region, I have some extra time to catch-up with some household duties and some needed rest, as well as to pen this blog on a Dominican restaurant. 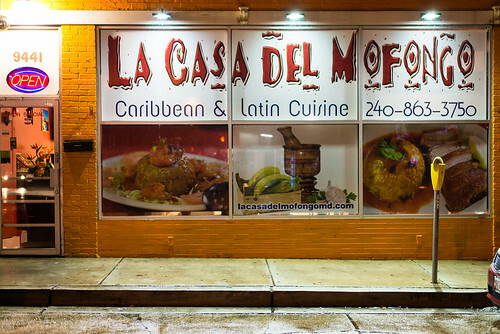 La Casa del Mofongo is located in Silver Spring, MD on the super busy Georgia Ave., just a stone-throw away from the Beltway exits. I had noticed it around a year ago when passing by there for some business, and its large self-promoting storefront piqued my curiosity with its bright colors and large photos of its dishes. 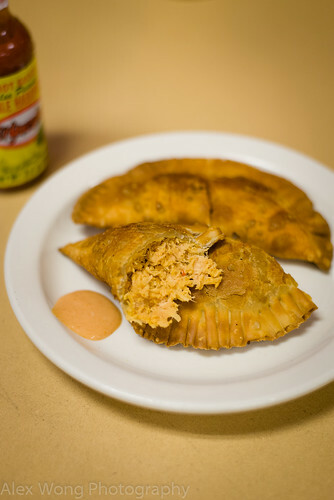 Dominican food establishments are few and far in between in an area where the Latino community is dominated by immigrants from Central America especially from El Salvador. But the metropolitan area has seen waves of new Latino immigrants from other parts of the Spanish-speaking world especially from the Caribbean. So when I eyed La Casa del Mofongo, I knew I had to step into it to learn more about this type of cuisine and taste their dishes. I paid it a couple of visits, one with a couple of DC natives, and another accompanied by a long-term acquaintance from the island. Walking in, you notice the deep-colored walls more befitting for the Caribbean sun, covered with large flat screens with direct transmission of Dominican baseball games, along with a ceiling looking like a checkerboard. The place is quite spacious covered with high tables on the sides and cafeteria-style furniture in the middle. 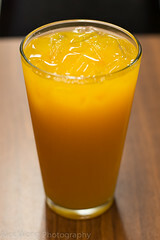 Taking our seat, the waitress took our order of drinks consisting of a glass of Chinola, or Passion Fruit Juice, and Guanábana, or Soursop Juice. The Passion Fruit was quite tart and sweet at the same time, tasting rather concentrated in flavor while waiting for the ice cubes to dilute it down – definitely a good dose of exotic fruit and Vitamin C. The Soursop was not so mouth-puckering since it is a milder fruit as well it was mixed with some milk, which is a version I have never tried before; I must say that I enjoyed this fruit-dairy mix, and my friend stated that it was common to mix fruit juices with milk on the island. 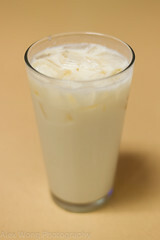 A similar concoction is mixed with orange juice, bearing the intriguing moniker of Morir Soñando or Die Dreaming. Initially, I was hesitant to taste the impossible combination of orange juice and milk, but a sample of it convinced me that this was a tasty combination reminding me of orange sherbet. Unfortunately, they had run out of this drink, but a glass of it will be an order on the next visit. After finding out that the establishment served the Dominican meat pastry, Pastelitos, which was curiously not on the menu, we ordered one filled with chicken, and the other with beef. The chicken patty was flaky and quite greaseless to the touch, with the chicken well shredded, quite tasty but just a tad too dry for my taste. The side condiment of Dominican ketchup was a tasty helper made up of the tomato condiment and mayonnaise. The beef version was also tasty, stuffed with ground meat cooked with a bit of vinegar. My Dominican friend remarked that it was customary to cook the beef with that acidic liquid, which I find to be rather odd at first. The other appetizers listed on the menu are Fried Salami, Longaniza Sausage, and Fried Cheese, but I prefer to have these fried pastries as my meal opener. An order for the main course for a friend of mine was Pollo Guisado, or Stewed Chicken (poorly translated as Sautéed Chicken on the menu). A big bowl arrived filled with pieces of the poultry sitting in a pool of reddish sauce, served along with the Dominican staple rice and beans. I had a taste from my friend’s bowl, and the chicken was literally falling off the bone, perhaps a bit overcooked (judging by some brown bits on the meat) and slightly stringy, but well-seasoned from the use of the latino mirepoux, sofrito, tomato sauce, and a good hit of the ubiquitous latino seasoning, sazón. It was a bit overseasoned and oversalted for me, but it is meant to be eaten with plain rice which would temper the flavor. My friend seems to enjoy this poultry dish, along the side of beans that seemed to have the same generous sazón treatment as the above dish. A main dish on another trip for my Dominican trip was Bacalao, or Salted Fish Stew (again poorly translated as Catfish on the menu). Dried salted cod has been rehydrated and cooked until flaking off the skin, then furthered cooked in a light tomato sauce. Again, I had to dip my spoon into my friend’s bowl (they don’t seem to mind since they know my MO) and had a good tasting of it. The codfish was properly cooked and quite moist from the rehydration and cooking with the light sauce, but I would have preferred a bolder tomato sauce with more depth in flavor and with a bit more seasoning. However, we both appreciated the fact that it was slightly undersalted which made this fish dish very palatable; the contrary is more common in other versions that I have savored. Again, the stew is served along the side of rice and beans. Continuing with the seafood motif, another friend targeted the King Fish dish on the menu. The piece of fish arrived well fried without any batter and nearly greaseless, topped by sautéed sweet peppers and onions slices. I initially found the steak overcooked judging by the extra firm outer layer (a common trait in Caribbean cooking), but after a few bites, I was starting to enjoy the rather moist interior portions and the proper seasoning throughout each bite. Furthermore, the fish flakes were akin to a steak with their firm and meaty quality, reinforcing the notion why the Caribbeans call this fish its royal name. The topping added some sweetness to the fish without detracting it from its spotlight; however, I would have preferred a light sauce alongside to add moisture to the fish steak. Coming to La Casa del Mofongo, one has to have at least a plate of its signature dish sitting on the dinner table – Mofongo. 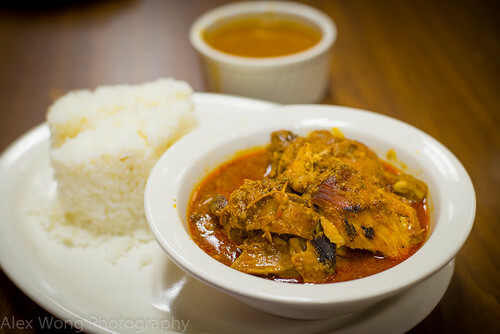 This dish traces its roots back to West Africa and it was brought over to the Caribbean by African slaves. 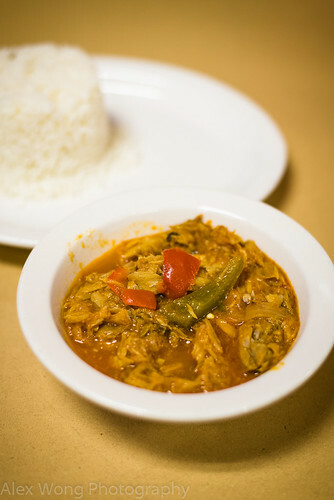 Interestingly, the Cubans still use its African name, Fufu, for its version of this starch dish. 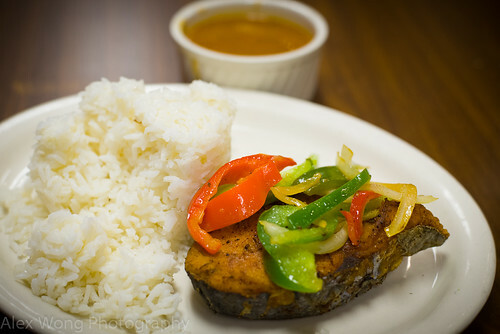 In the islands, instead of yam, the dish is made with fried green plantains, and mashed well into a pulp. And this place knows its Mofongo. Mine was well-seasoned with a mojo of olive oil that has been well-spiked by a good hit of garlic. Furthermore, pieces of crushed chicharrón, fried pork belly, has been thrown into the mix, which added more unctiousness to the plain starch. The topping of shrimp in red sauce (also comes in a white sauce) was the right order with its seafood sweetness, and the savoriness and moisture from the tomato-based sauce made the rather dry mound of starch more palatable. The ring of lettuce and tomato slices around the dish was unfortunately soggy and unnecessary, but it was not enough to distract my tongue from this Piece de Resistance. A side order of fried ripe plantains was a satisfying sweet accompaniment to the meal. Going against my customary ways, I forgoed a seafood order on the second trip for a popular Dominican meat dish, Sancocho. The large bowl landed on my table with chunks of pork ribs and beef, cooked just right to fall apart in the mouth. But the element that impressed me the most was the broth that was filled with the right flavors produced by some sazón and some recaito, a latino wet seasoning, and tasting full of depth calling my taste buds to revisit its flavors with more spoonfuls. The pieces of yucca, a common island staple, and green plantain, provided the starch and body to the flavorful soup and meat pieces, enough for me to ignore the side of white rice. This bowl was satisfactory both for the soul and the stomach, and I now know why this is perhaps the island’s national dish. The side of Haas avocado provided the necessary balance with its fresh creamy ripe state. 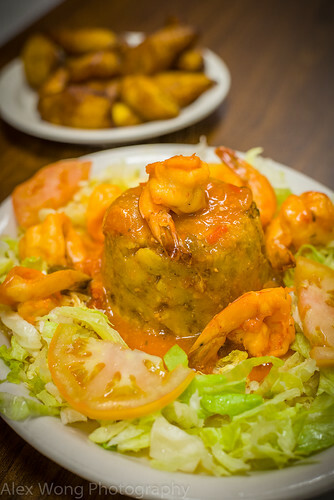 La Casa del Mofongo is one of the few Dominican eating establishments in the area providing tasty authentic dishes from the island, a cuisine that is not familiar to most tongues around here. 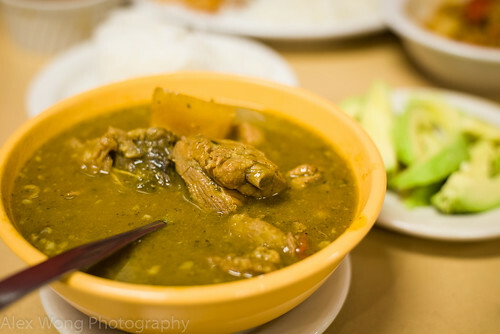 Its strengths are found in the seafood dishes like the King Fish and Bacalao dishes, the meaty Sancocho stew, and ultimately the dish that this eatery is most known for, Mofongo. 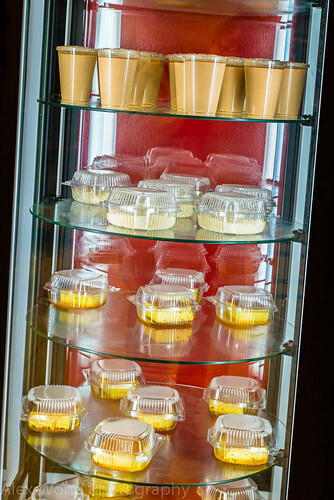 The tower of desserts in the dining room, consisting of flan, rice pudding, and sweetened beans, are equally enticing, so long as one has more room for them after ingesting the healthy-portion dishes. But this place will whisk the diner away from the current bitterly frigid Polar Vortex with a sip of its exotic juices, including the odd combo Morir Soñando, the Dominican Baseball league in the background, and the flavor-packed dishes hailing from the island. Polar Vortex or not, this place is the right locale to be transported away through its island offerings. where on georgia avenue by beltway is this ? by sniders and seminary road? Just before Sniders. Please click on the website link embedded in the restaurant’s name for more info. also, when are you going to african restaurants? Thanks for the recommendations. I have my eye on a Kenyan one – Swahili in Beltsville. I’ve been to Bukom before.